This kooky "deer simulator" met its Kickstarter goal and it looks like we'll finally get to give it a try, which is exciting news! Deeeer Simulator is officially funded, after seeking a $4,543 goal on Kickstarter. That means it can come to life, and we're all going to be better off for it. At the time of this writing, 167 backers helped bring the project to life with 65 hours to go in the project. We've been following the Deeeer Simulator news for some time now, because this insane game is something you just have to see. Haven't heard of it? Let us enlighten you, because you deserve to know more. The project is an interesting creation by solo developer Naspapa Games (otherwise known as 24-year-old Keisuke Abe). The idea is for you to hang out around town being as a little deer who's interested in causing all kinds of trouble. That sounds like a good enough premise to us. To do this, the deer can transform into animal-based mechs and other strange things, and it all looks totally nuts. Deeeer Simulator looks to fill the void that the hilarious yet buggy Goat Simulator left in our hearts, since we haven't gotten many more games in that vein for quite a while. And when we think about how this was all the work of one person, we end up smiling just a little bit wider. Unfortunately, there's no estimated release date for Deeeer Simulator just yet, seeing as it only just made its goal. We can't wait to see what it has to offer, though, because it seems like one of the funniest games we'll see all year. 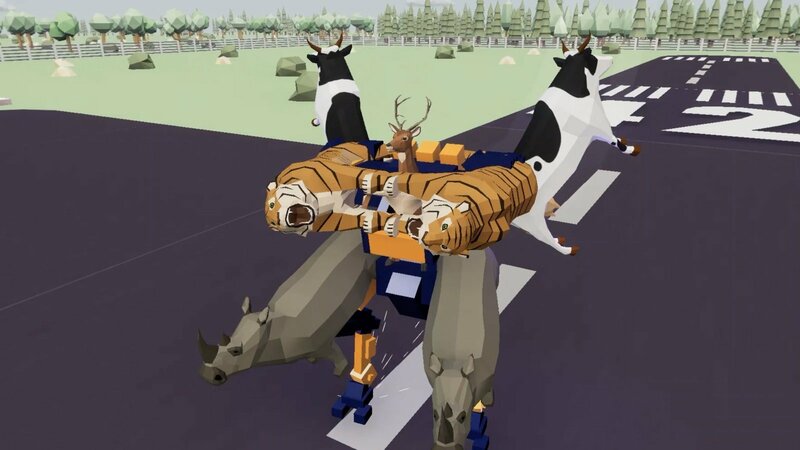 Do you think Deeeer Simulator is something you'd be interested in playing? Be sure to let us know in the comments below.